All right Paleo Nation, we've got a new host, Ashleigh VanHouten, on the mic and today's guest is none other than former PMR host, Tony Federico. He has now transitioned into the role of VP of Marketing for Natural Force, an all-natural supplement company. We're going to talk about his new job, the importance of prioritizing, what he has learned during his time talking to so many of the Paleo industry’s best and brightest, and what’s cooking over at Natural Force, the vision they have for the company, as well as some new things that are coming up. Tony also gives some great advice like why falling off your bike, both literally and figuratively, could be a good thing and passes the “podcast torch,” reflecting on some of his best moments and leaving Ashleigh with his final words of wisdom. How Paleo Magazine was like a beacon of light in Tony’s transition to the Paleo lifestyle. 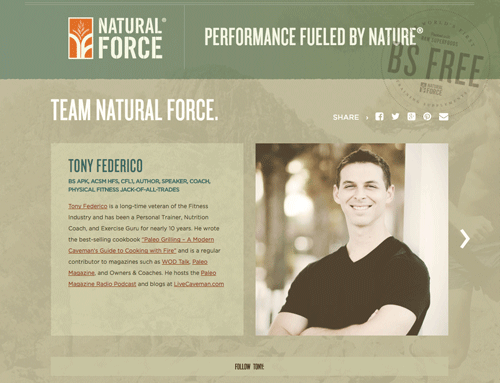 How Tony got the opportunity to be VP of Marketing for Natural Force. Why Natural Force supplements are different and really stand apart. Tony's perspective on whether to supplement or not. What a day in his new work life looks like at Natural Force. Tony’s opinion on whether the term “Paleo” has hit its peak. Tony's best moments as host of Paleo Magazine Radio. Tony’s final parting words to Ashleigh, as the new host of Paleo Magazine Radio. Eventually, a string of devastating injuries forced Steve to pump the brakes, and while searching for a solution he found himself going on a completely bare foot run with the Boulder Colorado barefoot running club. As the miles ticked by, Steve explored the information his shoe-free feet provided, and in doing so, altered his gait and mechanics such that he didn't even realize that he had run farther than he ever had in his life. That very first barefoot run lit a spark that changed the course of Steve's life forever and on today's Paleo Radio Bite, we discuss how. It's in your pocket, in your ears, and it's even in the very air you breathe, but we're not talking about a chemical or biological organism, we're talking about EMF. EMF is an acronym for Electric and Magnetic Fields. Naturally occurring EMF fields are generated by the earth and the sun, and as such, humans have been exposed to these fields since before we were humans. As with many things however, human ingenuity and innovation has led to the development of technologies that are changing the natural EMF environment. Power lines, cell phones, computers, wifi routers, microwave ovens, and numerous other electronic devices generate evolutionarily novel EMF fields, and the question we must ask is whether or not these new sources of EMF cause long term harm and contribute to disease. According to the National Institute of Environmental Health Sciences, "the few studies that have been conducted on adults show no evidence of a link between EMF exposure and adult cancers, such as leukemia, brain cancer, and breast cancer." They assert that the frequency of EMF emitted by household appliances is "non ionizing" and therefore relatively benign as opposed to the "ionizing" radiation of x-rays and gamma rays that have well documented harmful effects. Despite these assertions however, there are many anecdotal accounts of health issues related to low frequency EMF exposure. On today's show, we talk to a former Silicon Valley engineer named Jeromy Johnson who experienced a health crisis after wireless "smart" electrical meters were installed below his San Francisco home. Jeromy's "wireless wake up call" has led him to become an electrical health advocate and he believes that managing our exposure to EMF will become an increasingly essential ancestral health strategy. The unforeseen consequences of "the internet of things". The symptoms of EMF exposure. The potential long term effects on reproductive health and cancer risk that EMF presents. Tips for reducing your exposure to EMF. How to use technology safely. Why he decided to speak up about his experiences with an EMF related illness. What it was like to tell 2000 technology enthusiasts at TEDx that there might be a downside to inundating our environment and our bodies with EMF. Tim isn't even the first person to make these claims, he got the idea for a potato fast after reading about an 1849 diet prescribed to people who were "living too luxuriously" and who became overweight and "dyspeptic" as a result. More recently, both the magician Penn Jillette, as well as an Australian man named Andrew Taylor, have credited potato fasts for helping them to lose over 100lbs each. On today's Paleo Radio Bite, we phone in to Tim at his home in North Pole, Alaska, to find out more about his book The Potato Hack and how the much maligned tuber might be a health food after all.